It’s common to find racing games everywhere nowadays. It’s a fun genre that’s fun for almost everyone in the whole family, and it can even sometimes have great multiplayer! But you know, sometimes, even the greatest games can become a bit boring, especially if the market gets saturated with great racing games. So now we’ve got a game stripped down to the bare minimum, Drift Hunters, which is literally just about drifting! Don’t let that fool you though, you’re in for a hell of a ride. 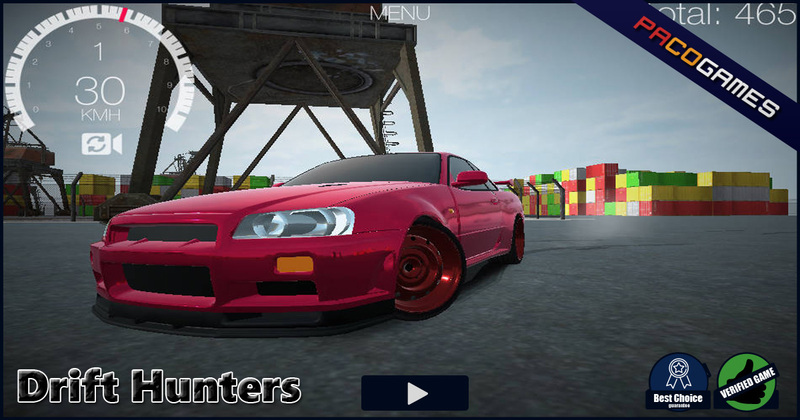 Drift Hunters is a driving game that gives you exactly what the title tells you, you hunt for drifts. You play as a driver that doesn’t race against anyone but himself, because the goal of the game isn’t really to be the fastest driver around, but to be the best drifter. You’ll do that by using your keyboard to control your cars. The W key is used to accelerate, while the S key lets you step on the brakes. The A and D keys will make you turn left and right, while the space bar activates your hand brakes, which helps a lot for drifting. By the way, when we said this game was all about drifting, we thoroughly meant it. You also buy stuff using drift, as the currency in this game is drift – like, how many drifts you’ve made. So the more drifts you do, the more money you have. There’s also a combo meter that’ll come up once you’ve done more than 50 drifts and keeping this combo going will give you even more drifts, so keep that in mind. You’ll use your drifts to buy different cars and upgrade all of your available cars. There’s also an option to change your cars’ appearances, but doesn’t really hold any bearing when it comes to speed or drift. Drift Hunters is pretty fun, but can get a bit boring after a while as you’ll be doing nothing but drifting on different tracks. The graphics and audio is pretty good though, so that’ll keep you on the game for a little while. If you’re looking for a quick, fun game to play, then this game is a good choice. This entry was posted in Car, Driving, Games, Unity. Bookmark the permalink.